If you’ve been looking for the perfect tool to help pick up dropped stitches, you’ve come to the right place. Fix-a-Stitch is available in 4 sizes — there’s one sure to fit your project! The 3 larger sizes come in a single package, and the Lace Weight size is sold separately. Once you use the Fix-A-Stitch, you’ll wonder how you survived for so long without it! Interested in carrying the Fix-A-Stitch in your retail facility? Please review our Information for Retailers section. We are happy to speak with retailers of all sizes, whether you’re a large national chain, or a local corner yarn shop! We can accommodate traditional storefront dealers with walk-in traffic, or online stores both large and small. Learn more about our retailer application process. 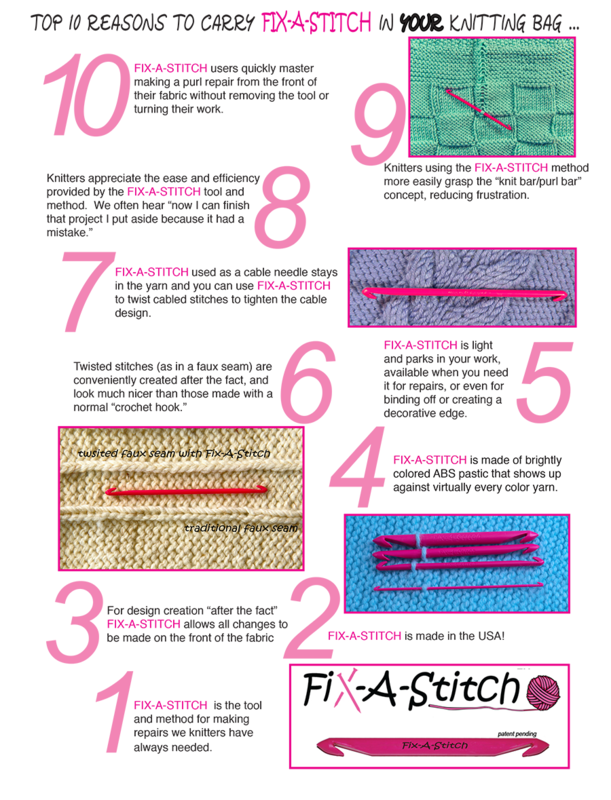 The Fix-a-Stitch is easy for both beginning and advanced knitters to use! View more how-to videos, including repair of Seed Stitch or Faux Seams. If you already have a Fix-A-Stitch, please let us know what you think!